Since the cold season has arrived, I thought I’d bake some suitable muffins. 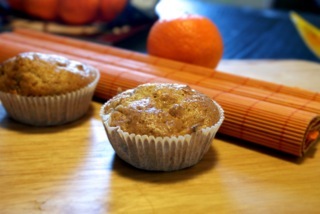 Just plain old muffins, spiced up with slices of apple, grated carrots and cinnamon flavor. Now, just mix the above ingredients. Put in the oven for about 20 mins, (400°F/200°C). Enjoy with a hot cup of tea! reporting! Keep up the good works guys I’ve you guys to my blogroll.